Sirion: The transformation continues – HubNut – celebrating the average! With me technically not able to drive due to stupidity, it was an ideal time for my good lady to experience a little Daihatsu magic. Incredibly, she quite likes it! I’d convinced myself that she wouldn’t, as the power-steering is rather on the light side. I was wrong. The powerful brakes took a bit of getting used to after months of 2CV driving, but it became apparent really rather quickly that this is a car that we can both enjoy. Perfect. Sadly, this joy has come at a slight cost. 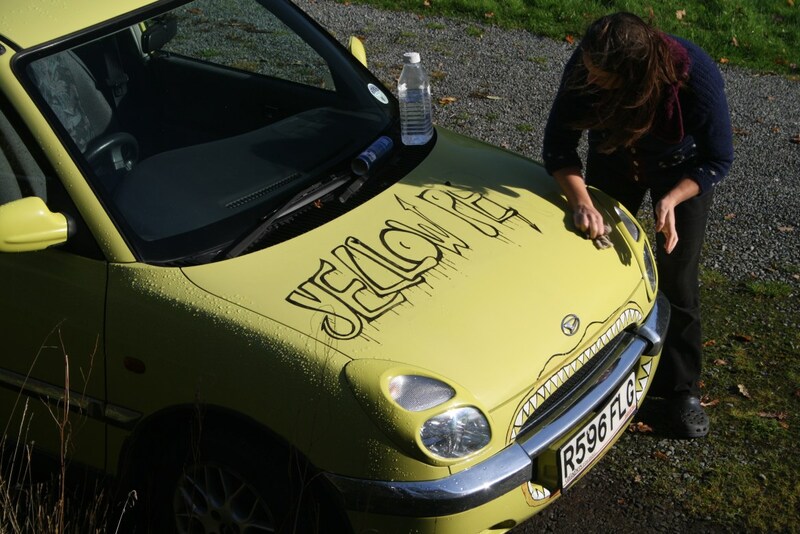 As happy as she was to drive it, Rachel has long complained about the Yellow Peril on the bonnet now. Therefore, this happened. It seems there was not marital agreement on the cool-ness of the writing. I really quite liked it. Above is how it looked for a time yesterday as we had to go out in it before it could all be removed. 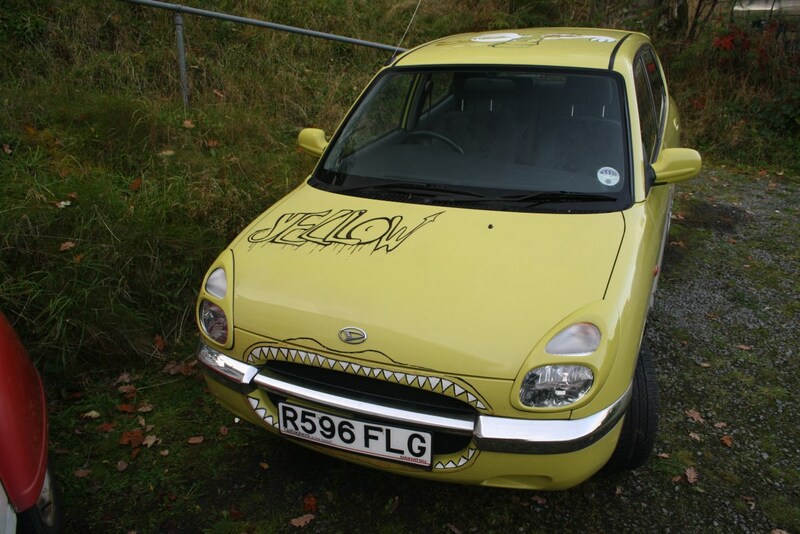 Even the Yellow has gone now though – the car is a far cry from the one I purchased at the beginning of the month. It has been very satisfying to effect such a transformation using so little money – which is good as I really have so little money at the moment. I think I spent comfortably less than £10 on materials and the car has gone from a jokey mess (in most people’s eyes) to a still-quirky-but-more-sensible little hatchback. It has been a lifeline this week as I’m still struggling with driving. That super-light power steering becomes a real boon and the nifty gearchange also helps. That said, I was tooling around in the Discovery today, which surprised me by being very comfortable to drive with my iffy thumb. We’re not contemplating using it for an upcoming roadtrip to Sussex though as it is far too thirsty. As it is, I’ll get a chance to see if I can crack the magic 50mpg barrier – as Rachel is likely to be sharing the driving, this seems very possible.